I live in Michigan, and this past weekend drove to Niagara Falls. 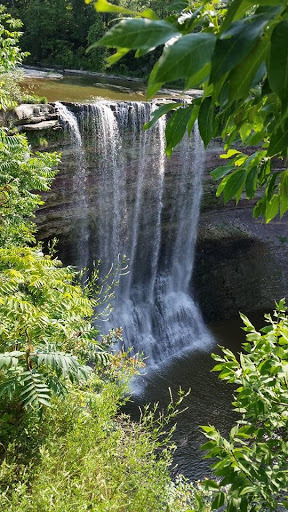 You may not necessarily realize it, but along the way, there are a significant number of other waterfalls, especially in the Hamilton area. Now, none of them are even remotely as big as Niagara Falls, but they are nowhere near as busy. If you’re looking for a peaceful, relaxing waterfall, then one of these might be more of your cup of tea. I only stopped at one waterfall, Lower Ball’s Falls, along my way. There is also an Upper Ball’s Falls, but it required a hike, and was on a tight schedule. (It isn’t a long hike, though.) The hike to Lower Ball’s Falls seemed much shorter than the advertised distance, even accounting for the conversion from kilometers to miles. The actual trail may be more extensive, leading to a longer listed hiking length. Obviously, it is better to visit waterfalls in Spring and early Summer because of the higher water flow, but in this case, there may be another reason too. The water was actually flowing fairly well for mid-July…But the trees and greenery were in full bloom. This made it rather difficult to see the whole falls. In the spring, before any leaves and plants are out, you’ll likely be able to see the whole falls better. From the QEW, take exit 57 heading south onto Victoria Rd. Pass ON-81 and ON-73. Shortly after passing ON-73, you’ll see Sixth Avenue to your left (assuming you’re headed south). Follow the signs to Lower or Upper Ball’s Falls. It was relatively straight-forward. Where in the World is Lower Ball’s Falls? Horseshoe Falls is rather complicated. It’s shared between New York and Ontario, and can be better seen on the Canadian side. We viewed the falls from the American side, which I think leads to a more impeded view. If you want an even better viewpoint of the falls, you could try the Lady of the Mist boat, though that definitely costs a considerable amount. You’ll definitely be experiencing the falls, though! Horseshoe Falls is beautiful, but it suffers from man-made effects. Because of the dam that cut off half of the falls, this leads to a very misty effect around the falls, making it rather difficult to see the falls from afar. Your view is blocked by a whole bunch of small, tiny water droplets conspiring to lessen the attraction. Oh well, it’s still amazing the amount of water flowing over the falls. Where in the Word is Horseshoe Falls?